There’s one little problem when you commit to maintaining a blog with updates on your charity and running exploits – work. Forget the commitment of hours to long runs, the social agenda, the recovery sessions, even though they eat into your limited waking hours, they pale into insignificance when you have a full time job to hold down. Anyways I’ve managed to find a quick 30 minutes to update you on the past fortnight. Tuesday – Training program says 5 lots of 400m sprints with a 1 min recovery walk between each. How easy is that going to be? Under 3kms, surely a piece of cake. What it actually means is run as fast as you can for a lap of an Aussie Rules footy oval, walk slowly, run as fast as you can again (but slower than the 1st time as you’re still stuffed from the 1st one), walk slower, speed up again, walk even slower, speed up again if you dare, walk walk walk maybe even add 10 secs to the recovery, go fast again even though you need to stop to throw up, hold it in you only have a couple of 100 metres to go, stop short, double over, wonder why you chose bananas for breakfast, hope it’s still dark enough for none of the locals to recognise you, stagger for a minute, plan on doing a 5 min recovery jog, actually jog for about 2 minutes and then through in the towel. Go home re-eat the breakfast you lost, shower, feel nauseous for an hour or two and then complain about sore legs. Thursday – An easy 50 min run. Clocked 7 kilometres at 5.20am so probably could have travelled a bit further if I could have seen more than 5 metres in front of myself. Pitch black and about 4 degrees Celsius, but the added advantage of no passing cars as everybody is still smart enough to be snug in their beds. Walk home with the added advantage of spotting the people heading to the running track, safe in the knowledge that they still have to commence their run, I’m all done. Saturday – Not part of the training plan, but how can I knock back a ParkRun when the kids have a soccer “bye” and I (again) have a free Saturday morning? The long runs, sprints, hills etc are obviously weaving their magic as I clocked a personal best (that’s more commonly known as “a PB” for insiders) of 30.09 for the 5 kms. Only a couple of weeks ago I was lamenting if I’d ever break the 30 minute barrier – under 6 mins per km for a sustained distance. Well nearly there, if I’d only been at the start of the pack at the start I could well have made up those lost 10 seconds!!!! Maybe next time. Now is probably a good time to show how training three times a week can improve your times, and I’ve noticed a considerable improvement in my 5km times since I’ve been running 10km+ in training. Below is a history of my ParkRuns – the same course and distance every week so a fair indicator of the improvements (although there are obviously weather impacts they wouldn’t be significant enough to slow me down almost a full kilometre). Sunday – long run day – as per my last instalment I add 2kms to each long run, so this week it was 18kms. Not a lot to add here – a slow slog for 18 clicks, sore legs, sore body, sore shoulders, about 2 x 50 metre walks up a hill when I got to laps 14 and 15 of the 1.2km track. Eventually done and a slow stagger home. Averaged 7 mins per click so was happy with that. Surely I can now run a further 3 kilometres and finish a half marathon. Don’t know about a further 24 kilometres though – still have 5 months to get my head around that. Later Sunday I had that “euphoric” I’ve been for a long run feel, that’s the moment when you decide to enter more official events, or put your name down for some obscure fund raising activity (anyone up for getting their head shaved or maybe a few rounds of boxing?). What I did was made the first commitment to running the Hobart Marathon in January…well I booked the flights, next step is somewhere to sleep and then on 20 September (the date entries open) I’ll be putting in my first ever marathon entry…..small steps but the commitment is there, may as well run it, I’ll be in town. Tuesday – 3 km time trial. 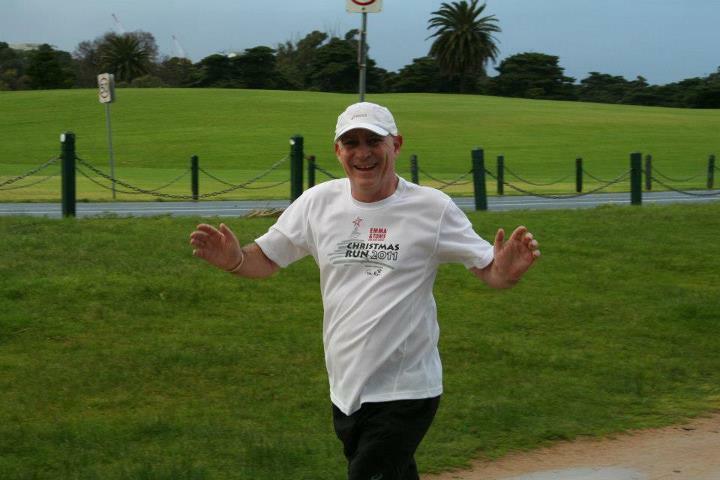 Was still a tad stiff and sore from the 18 km run on Sunday but managed to punch out 3 in 18.17. I was happy with that as it wasn’t that long ago it would have taken me 20 minutes. This one it was at 5.25am (so pitch black again) and a shocking head wind down one side of the oval with no tail wind on the other side as it’s protected by the grandstand. Finished that had my breakfast and headed into town for a 7.30am blood donation appointment. Overall a productive morning. Which I followed up with about 10 pints of beer that evening at a work team function. Wed – Saturday – decided it was a week to take it easy. Had a chiro appointment on the Wednesday night as my back was playing up, probably from the long run on Sunday, all through my shoulders and neck area. It’s now looking as though it will be a regular fortnightly visit throughout this journey so add in the costs for treatment to the multiple pairs of shoes, gels, creams for tender spots, anti-inflams for soreness, band-aids and creams for blisters, apparently you need expensive socks too, all up this commitment is going to cost me to equivalent of a herd of goats and a well for a village in some third world nation. That’s not even counting air fares, accommodation and entry fees!!!! 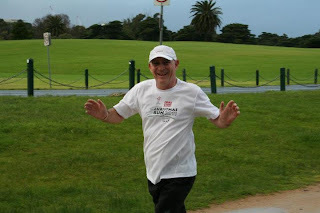 Sunday - Planning for a long run was thrown out the window as I was invited to a fun event through the streets of Melbourne. The Royal Melbourne Zoo as part of their 150 year celebrations have arranged for 50 baby elephant sculptures (modelled on Melbourne Zoo’s own Mali) to be decorated by artists and scattered throughout the greater Melbourne area. 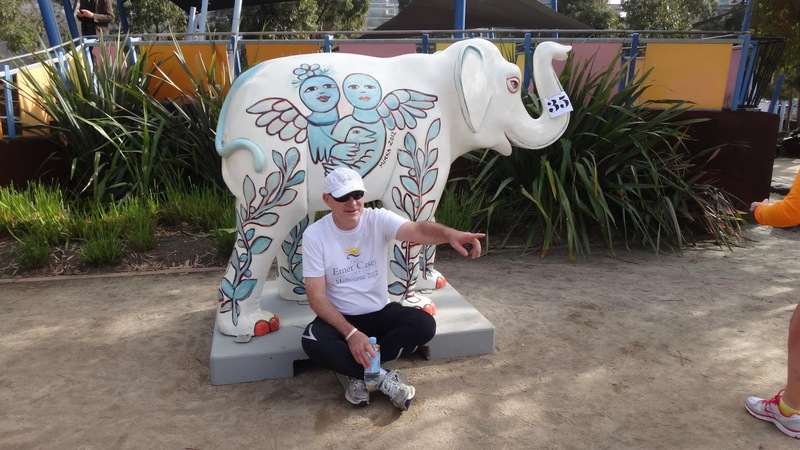 Our own ParkRun organiser arranged a “run” to visit (and photograph) all 50 sculptures. This trek would cover approx 25 kilometres and take about 3.5 hours. Here’s the honest bit – all the “acceptances” for the event run marathons (well nearly all of them), I’d run a maximum of 18 kms in my life, I’d had a lazy week, they run fast (well faster than me), so I decided to join them about 2 hours in at elephant number 22 and I’d take in the last 28 sculptures. What a great time I had (even if I was the only one praying for red traffic lights so I could get a breather). All up 11.1 kilometres for me, taking in a few hills, busy Melbourne streets, all ending in a coffee and a meal over looking the Yarra River. So here’s a tip, you can make any long run interesting, instead of lap after lap, just add in a challenge, a few friends and suddenly you have an event. This week is a few slow training runs culminating in a charity event for Kate and Turia, ultra marathon runners who were caught in a bush fire in the El Questro Wilderness Park last year. On Saturday, myself and 12 of my work colleagues are running two laps of the famous Tan track in Melbourne (7.4kms) to raise funds for the ongoing living and medical expenses for these amazing girls. For more of their story go to http://www.ultraspirit.com.au/the-story/ or to donate to our fund raising visit http://www.everydayhero.com.au/team_cgu CGU Insurance will be matching us $ for $ in our fund raising (up to $1,000) so whatever amount you can spare will be doubled before it gets to help out Kate and Turia. I’ll have an update on the event in next week’s blog instalment.